We discovered this stunning Hog bay beach during one of our vacations in Bermuda. This is one of the best kept secrets of the island and very few know about the beach. I probably wouldn't share the info with anyone and rather enjoy the sheer exclusivity, unless my wife insisted that I put it up as part of this website. Hog bay beach is located in Sandy's parish. It takes some effort to reach this beach through a trail in Hog bay park, but once there it's usually yours exclusively! So why is Hog Bay Beach so unknown in Bermuda? Because you need to walk quite a bit through a rocky and wooded trail to get to it, and it is only a beach at low tide. During high tide, the beach disappears completely. So the beach is usually available for you to enjoy only for about four hours a day. But for us that's a privileged exclusivity for four long hours, and we thoroughly enjoy the walk through the trail as well. As you walk through the park, there is a winding dirt trail leading past an old kiln near the entrance. 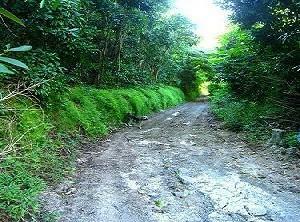 Then the trail rises past numerous tracts of agricultural fields and cherry, loquat and spice tree forests, before descending to serpentine seaside trail. At times it’s quite steep. Follow the main trail down to the shoreline, and you will find this marvelous gem - Hog bay beach. It's a tiny beach at low tide and a beautiful area for swimming and snorkeling. At low tide, the shallows extend some 300 meters into the sea, and is excellent for snorkeling. But you should get hold of a tide chart to time your visit correctly. You can get a tide chart in the website weather.bm for any day. There is a menu option on the left for Tide Times. Visit that option, then choose a month and a day, you will see the high/low tide timings. But add another 10 minutes to the times shown because the chart shows tide times for St George area which is in the east while Hog Bay Beach is in the west. If you like to beach comb in search of some great finds, Hog bay beach is the place for you. We have found an amazing array of rare and unique seashells here, as well as some really cool looking pieces of driftwood. Underwater sea grass attracts turtles here. So you can often see turtles near the beach. There are rock pools in the area that are full of crabs and sergeant majors. Depending on the time of the year, there can be many spiny sea urchins at Hog bay beach. So some kind of footwear is recommended. You can actually explore a long section of the coastline with the wide south shore stretching out as far as you can see. How do you reach Hog bay beach? Go to the Beach Map to view the location of Hog Bay Beach and several other great beaches. 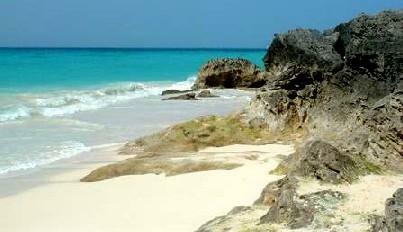 The beach is part of a National Parkland called Hog Bay Park in Sandy's parish which is owned by Bermuda government. The park's 32 acres of open space starts from a roadside car park on Middle Road and extends towards the coast in the west. Access to the beach is on bus route #7 which operates between Hamilton City and Dockyard. From dockyard the bus stop is about 12 minutes. From the bus stop, walk through the park will take another 10 minutes or so. The park is open daily and admission is free. Hi Raj, Love your informative website. It's been 10 years since I've been to Bermuda via cruise. I'm thinking of visiting Hog Bay and click your link to the tidal times. Question regarding the tidal times for 10/12/16 5:57 | 1.1 / 3.6 How do you read this? Thanks in advance. Hi, the first two figures are the date and time. Next two are height of tide in meter and feet, so in this case 1.1 meter tide (i.e. 3.6 ft) which is considered somewhat high tide. A low tide should be around 0.2m (or 0.7ft). Raj, thank you for the great site. I spent a lot of time researching Bermuda and your site had awesome tips. My wife and I took the bus from King's Wharf and hiked to the hidden beach at Hog Bay Park. It was incredible! We had the place (and the mile or so in each direction) to ourselves for 3 hours until we left to go back to the ship. The water was calm and we saw sea turtles, a large school of HUGE parrot fish, and several big sea shells (with critters still inside). The hike from the road takes about 10 minutes and is steep so it's not for older folks or for people pushing strollers. However if you want complete seclusion, get your hands on a tide chart and take the #7 bus to the park. Thanks again!! Well we found Hog Bay Beach. Unfortunately there was very little beach left by the time we got there but there was some. We were leaving on a cruise ship so couldn't go back for the next low tide. It was beautiful! I'm so disappointed we didn't stop on our way back to the ship the day before, that would have been the perfect time. Just another reason to go BACK TO BERMUDA!!!!!!!! Thanks for putting all the information on a website. It was quite helpful on our island explorations. Hi there ~ first I'd like to say I love your site. It is passionate and informative and I am sure I will be back here many times before my cruise on September 23rd. When was the last time you were at Hog Bay beach? Do you know when low tide usually is? I really want to check it out, but I need to make sure I can get there in that four hour window. Thanks! Hi John, you will get month by month tide info in www.weather.bm. There is a menu option on the left for Tide times. You can choose a month and see the high & low tide times for all days of the month. However the tide times given in the charts are for St. George (i.e. eastern end of the island). For Hog Bay located at the western end, add 10 minutes. Hope this helps! Have a great time in Bermuda. I lived at Doubloon Hill Farm (which is now part of Hog Bay Park) during the mid to late 60s. I agree it is a gem.